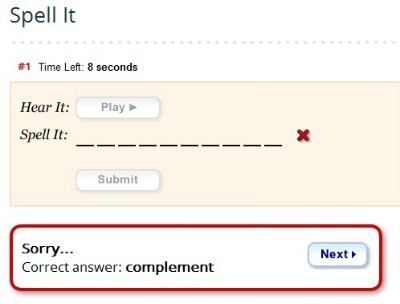 Note that you may omit ‘that’ – the link between the two sentences. Adverbs of degree and what we call ‘gradable words’ are a complex grammatical matter, so I propose we consider them in a separate session next time, before we continue with other emotions one can express. Hopefully, next time he’ll come bearing gifts. Now, if we use verbs like ‘hope’ and ‘want’, etc. in the progressive (continuous/-ing) form, we’re expressing greater tentativeness and tact. By engaging these expressions, you are actually showing less directness. The result is to slightly sweeten a hidden request. - Socialize It! (for including Facebook kind of buttons, Like buttons and other social media facilities. Although quite limited, this adds a kind of ‘connected’ feel to a website. I’m not using it right now, for my own reasons. I tried it and I decided that I prefer the real thing, to the look-alike buttons, so I’ll wait until I’m in a position to engage fully in the main social media stream. - The Libraries are very useful storage places for pictures, links inside my website and outside to other websites, a space for my forms, which can be for joining the club, for the various quizzes I build for our readers, or for exercises you find on various pages in the website. - Quick Preview It! allows one to view HTML editor-built pages with the content of all the SBI! - Fav It! allows me to upload a favicon which is a small icon for a website that appears in your address bar, and also in your bookmarks/favourites folder. - Verify It! 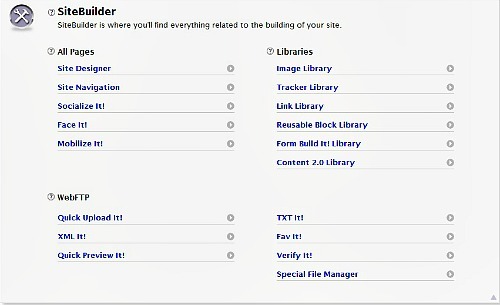 lets one upload ownership verification files that Google Webmaster Tools and Bing Webmaster Tools provide. - Special File Manager allows me to manage the media and support files (mentioned above). You can see how complex this system is by now. However, there is nothing in that system that is not covered by a lesson in the web design course, in the forum threads, or available from one of the kind system support technicians who are available to us 24/7 on an online chatline. From the same website I’ve introduced to you before (Merriam-Webster Dictionary), I’m bringing you a new game to improve your spelling. Spell It is not as funny as the first one we had (Spelloween), but it’s great in the sense that it allows you to listen to the words first and then spell them. This gives you the chance to improve the skill of associating the sounds you hear with the correct combination of letters in order to spell the words, which is one of the most important aspect of spelling correctly. Children learn English by using the ‘phonics system’ today (well, adults do so also). The phonics system is based on the skills of recognising distinctive sounds, in order to transcribe them into letters. At the same time, knowing the sounds that various letters (and combinations of letters) make, help one read the words with the correct pronunciation. Basically, this is what one needs for good writing and speaking. 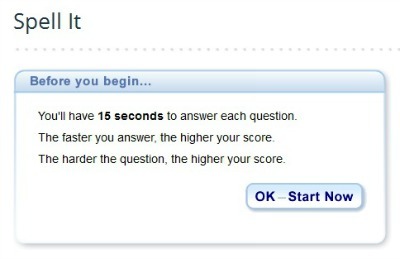 In this particular game you will have 15 seconds to answer your questions, but you actually get extra points if you answer quicker AND if the questions are more difficult. 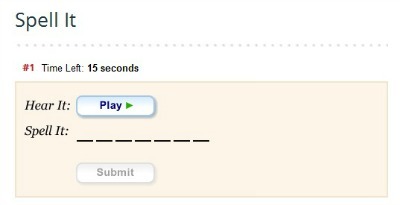 As you can see in the picture below, you can actually use most of your seconds for playing the word again and again, until you get the right sounds and then use just a few seconds spelling it. 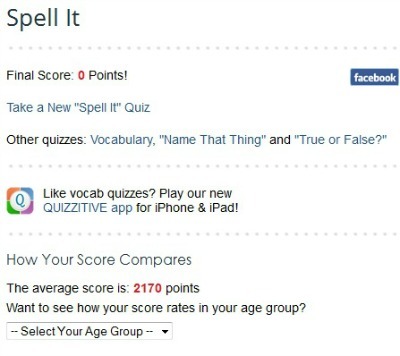 If you enter a word spelled incorrectly, the system will give you the correct spelling. Well, I discovered on this occasion that I am actually missing a sound plugin on my computer, consequently, I cannot enter any words correctly. Nevertheless, I went to the end of the game, only to show you that you get your final score, together with the score rates in your age group. 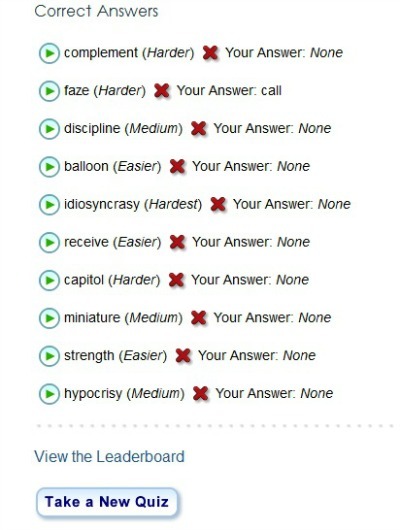 You also get the list of your random words with their level of difficulty and an invitation to another quiz. This seems a little more complicated, but not as complex as our last spelling game, Spelloween . So now you can try each one in turn and pick your favourite. Don’t forget about an old favourite of mine, Free Rice , which is also a great game for improving your spelling.